DAET, Camarines Norte (Bicol Standard)—As an art form, tattooing is unique in that it has various subcultural connotations that no other art form is able to offer. Taking the dermis as its substrate, it is able to carry out symbolic functions of spiritual devotions, stands as marks of courage or community, and even signifies pledges of undying love. Like other art forms, it can also be purely decorative or pictorial, but even then it always has undertones of defiance against societal standards that deem the skin as unfit for art. Still and all, it has persisted throughout centuries, even in the Bicol region which has remained largely conservative in its mores. In this town, CMTattooHive, which holds office at F. Pimentel Avenue, is leading the deletion of the stigma against tattooing while promoting local culture and uplifting the tattoo industry. This year, it spearheads an on-the-spot tattoo competition called “Padagos”—a Bicol word that means to continue—aiming to help categorize tattooing as a fine art. It takes as its theme Bicol mythology, hoping to encourage tattoo artists to consider making original designs from local stories. Part of the organizers’ effort in deleting the stigma is holding a seminar that discusses Hygiene and Sanitation andTattoo Waste Disposal, in partnership with the Provincial Health Office. 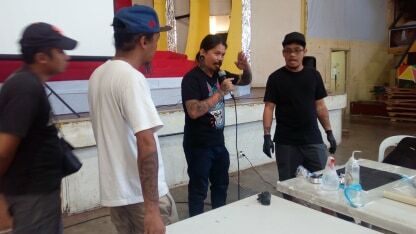 To up the ante, the organizers invited top-caliber Filipino artists as judges, including Dyani Lao, who advocates the use of Philippine-mythology-themed tattoos; Jaime Tud II, a Hall of Famer in tattoo competitions; and Noel Cornel Alegre, the brother of famous Daet visual artist Hermes Alegre, who has also contributed immensely to the promotion of arts in the academe. 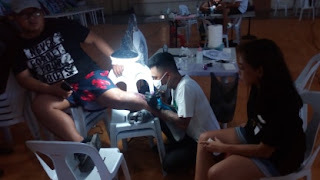 Tattoo enthusiasts not only from Camarines Norte but also from other parts of the country trooped to Daet for the competition last April 7 at the Camarines Norte Agro Sports Center. 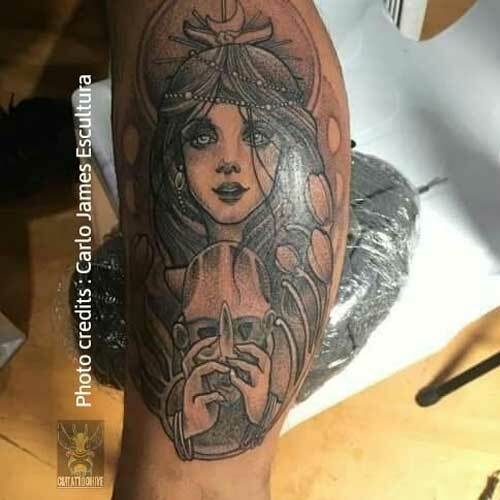 Jeff Agao of Sampaloc, Metro Manila, took home the grand prize, with Haliya, Bikolnon Masked Goddess of the Moon as his subject on model Carlo James Escultura. 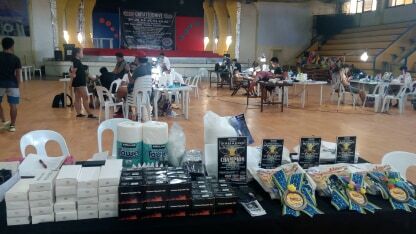 Agao took home a cash prize, tattoo supplies from CMTattooHive and InkArmour, and a gift pack from Lakaw Shoe and Bag Designs. Padagos was made possible by ArtSikrap Online Gallery, Lakaw Shoe and Bag Designs, Wynner Printer Services, Kusina ni Pierre, Juanito’s Resto Bar, Superlines Transportation Company, One Platinum Hotel, Inktensity Tattoo Studio, ACLC Daet, Ink Armour, Aklatan sa Kostal, the Provincial Health Office, the Provincial Tourism Operations Office, and the Young Artists' Guild of Camarines Norte. The event is part of the long list of activities in celebration of Camarines Norte's Bantayog Festival 2019.